Since reading Dr. Mutti-Burke’s book, On Slavery’s Border: Missouri’s Small-Slaveholding Families 1815-1865 in my first semester of grad school, I have become interested in power relationships between enslaved African-Americans and their said “masters” in Missouri. No two relationships were quite the same and they were as varied and diverse as the people and personalities that entered into them. The only thing that characterizes all of these relationships is that the folks with the white skin were supposed to be the ones in control. Michel Foucault would have a field day with a study of the following power relationship. While researching for the Wornall House Museum project, I stumbled across a newspaper clipping at the Jackson County Historical Society that caught my eye. It is a type of juicy tid-bit of history that displays how easily our society was willing to first, elide the sins of slavery and second, a bit of that dynamic of slave-master power relationships. Like many of the Wornall stories, I am finding a couple of differing versions. Here is one version of “Old Hattie.” This article is undated and clipped from the Kansas City Star and it tells the story of “Old Hattie.” My research informs me the article is circa December 1927. At a slave auction in 1855 at Boone’s Store in Westport (now Kelley’s Bar) there was up for bid a 13-year-old slave girl named Hattie. She was about to be sold to a “cruel” master and begged a “kindly looking” man to purchase her instead. That man was Westport trader and city father, Charles Kearney. He was cashing in on the Santa Fe wool trade before the war and apparently had cash to spare. The bidding became heated until Hattie finally sold to Kearney for $1300. That was a fortune in those days. Kearney took Hattie home and set her “free” . . . to work for the Kearney family for the rest of her life. And she did just that. She rose two generations of Kearney’s children, became ingrained in the family’s life, and adopted the family name. Colonel Kearney’s oldest daughter, Julia, married Frank Wornall, and it appears that for a time Hattie lived at Wornall House raising the Wornall children. She reared children and cooked meals and likely knew those families better than they knew themselves. In her later years the extended family members would squabble over which family would get the privilege of having Hattie be the live-in maid/nanny. She lived to be 91 years old and enjoyed “listening in” to the radio in her last days. Irony abounds in this story. From our twenty-first century perspective it is easy to see the irony of buying a person, taking them home , and setting them “free” to work for your family until you die. 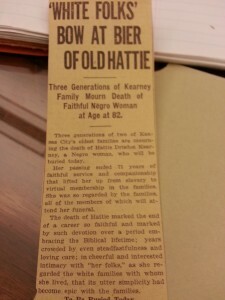 But perhaps more nuanced in the story is the ultimate power Hattie wielded over the Kearney and Wornall families. Then again, perhaps not: the headline practically of screams about Hattie’s power. What do you think? This entry was posted in HistoryMaking and tagged Colonel Kearney, Dr. Diane Mutti-Burke, Jackson County Historical Society, Michel Foucault, Old Hattie, Tony O'Bryan, Wornall-Majors House on April 21, 2014 by Tony Lawson-O'Bryan.